I’m going to share with you a secret in this post that you may not know about. Sure, some of you will already know about it, but I feel quite certain that most of you will never have before. You may even think this is a little crazy, but you’re going to have to trust me this time. You cannot go wrong with this! 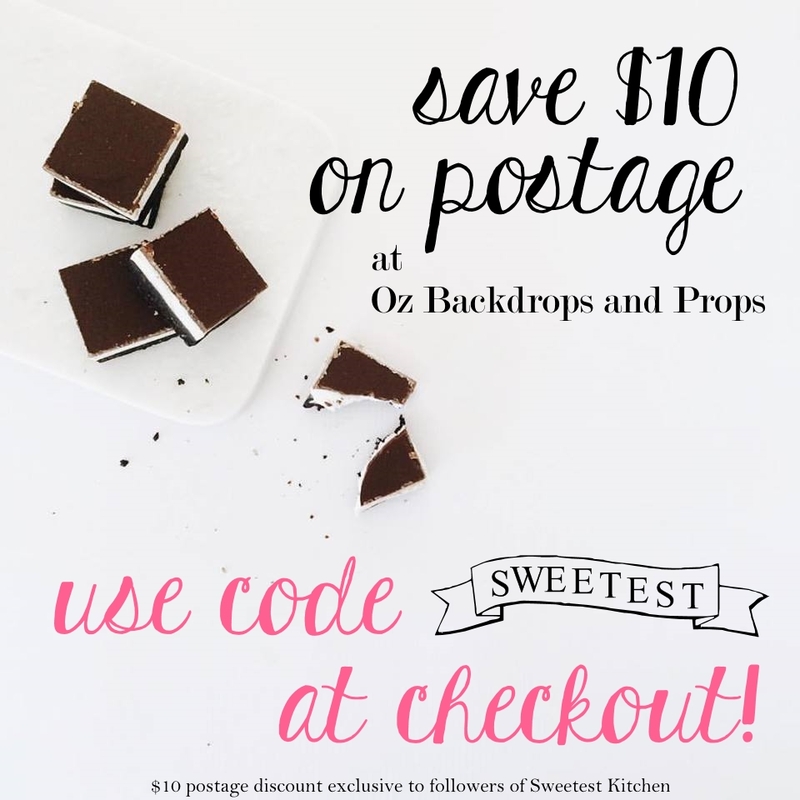 These are super kid-friendly treats as well, so let’s discover this secret! Imagine this… it’s a really hot day. You’re craving something ice-cold to cool you down. You’re thinking about those popsicles in the freezer; they may be made of numbers instead of real ingredients, but they’re cold and you want one! You open the freezer and see the bowl of frozen grapes you put in there a couple of hours earlier, anticipating the hot day ahead – oh yeah, you forgot about the frozen grapes! What a great idea, you think to yourself, and you reach for the bowl of healthy frozen grapes instead of an unnaturally-colored popsicle. Wait a minute. What? Frozen. Grapes. That’s what my daughter’s friend said when we offered her some yesterday while she was over to play! Did you know that grapes do not freeze solid? 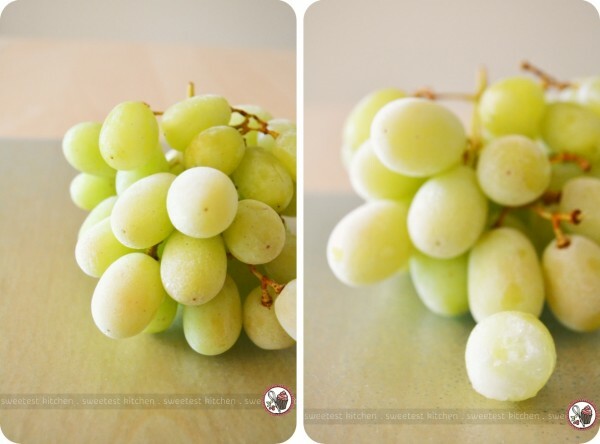 When I first heard about frozen grapes (not even a couple months ago, myself, actually), I was very skeptical. I didn’t think it would be anything special. Just like sucking on an ice cube, maybe? But no, not at all. Pluck a grape from the freezer about 2 or so hours after you place it in, and it is like eating a little ball of sorbet. And my goodness, do they ever get cold. The type of cold that makes your teeth hurt and freezes the insides of your cheeks – it’s a beautiful cool-you-down-immediately treat on a hot day. And you know what? My daughter’s friend loved the frozen grapes! I’m also very excited to say that my daughter now prefers frozen grapes over popsicles. Don’t be afraid, just simply wash your grapes after you bring them home from the store (as I presume you would do anyway), give them a gentle pat-down to dry them, place them in a bowl or plate and stick them in the freezer for at least 2 hours. You could leave them longer; the longer you leave them in the freezer, the firmer they will get, but they will never freeze solid. I wouldn’t recommend leaving them in the freezer much longer than a day, as I tried this and they seemed to lose a bit of their flavor. What other fruits can you freeze? Well, you can freeze bananas. Most people freeze bananas to use in banana bread or muffins, sometimes in smoothies. But have you tried pureeing frozen bananas all by themselves? No? I didn’t either and had never even thought to do such a thing until recently. So what does happen when you puree frozen bananas all by themselves? 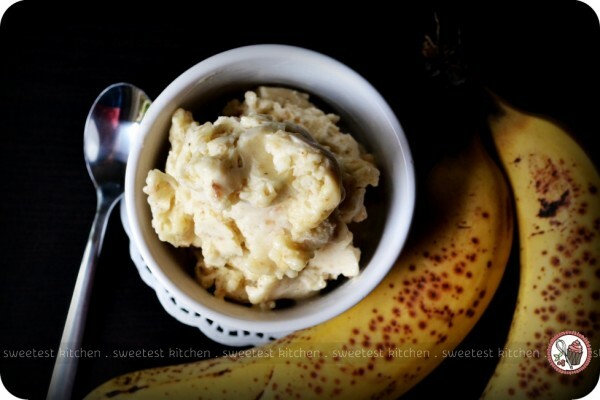 One-ingredient banana ice cream. I can almost see the look on your faces! I might need to repeat this. When you put frozen bananas in the food processor for a minute or so, you end up with banana ice cream. It is true! And the texture is perfect, just like real ice cream. It’s a cold and lovely treat on a hot day and it’s so easy to make. I recommend you use nearly over-ripe bananas for this recipe, like the bananas in my photos. Start the recipe a couple of hours before you think you might want to have the ice cream by peeling and slicing the bananas into thin slices (not quite 1/4-inch thick). Align the slices in a single layer on a baking tray (or similar) lined with baking paper. Put the tray in the freezer for 1-2 hours – I go with 2 hours because I find that they are firm enough by then to give a great texture for the ice cream. After 2 hours, place the banana slices into a food processor (not sure if a blender would work instead?) and process, scraping down the bowl when needed, until the bananas start sticking together in a ball. They will start out looking like little banana-pebbles, but keep going; you’ll know when it’s ready! This is a healthy alternative to real ice cream, but if you’re feeling like something a bit more indulgent, you can blend in some Nutella or peanut butter, just before the bananas start coming together in the food processor. Or add strawberries, raspberries or other fruit when you’re ready to serve, or sprinkle over some peanuts. You won’t be disappointed! I was just simply amazed by this! I treated my daughter to a bowl of this banana ice cream last week, after her tonsillectomy, and she was nearly licking the bowl clean! 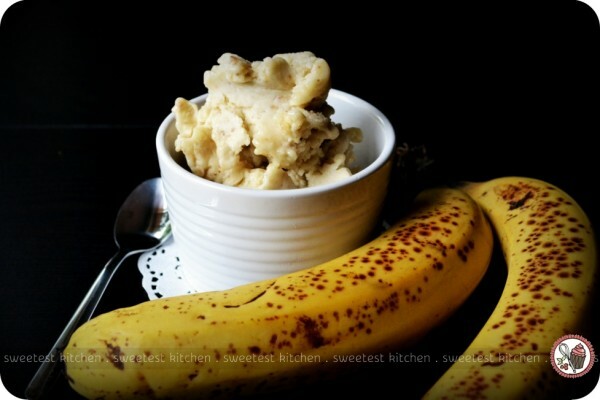 Note that you should serve the banana ice cream straight away, or it’ll start to turn brown (as bananas tend to do). 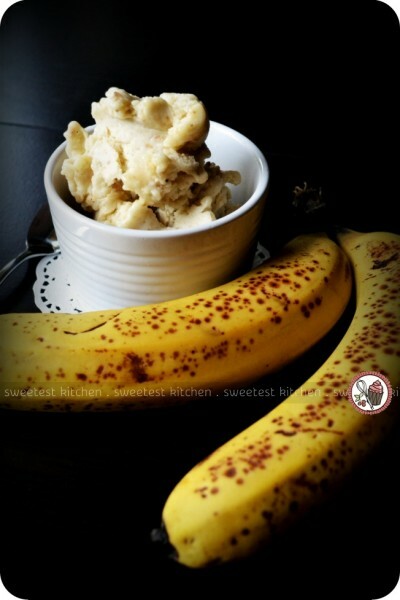 I haven’t tried this yet, but I wonder if the banana ice cream trick would work with caramelized bananas? That would make a delicious ice cream! And are there any other fruits that under-go a magical transformation in the freezer? For example, has anyone tried making strawberry ice cream out of fresh frozen strawberries? Let me know any other tricks/secrets you may know about frozen fruit! My grandmother used to give us frozen grapes all the time as children. We LOVED them! Thank you for reminding me of this wonderful healthy snack. Lol I only started doing this last summer but i use the big seedless globe grapes i find it works better with ones that kinda look frosted when your at the markets i guess the ones that arnt over ripe, and I have bought the frozen berries from IGA to eat for a snack so i’m guessing if ur froze your own they would be just a great. I used to rehydrate dried apples in cold water when i was little and we would eat the apple and drinking the flavored water. We love frozen cherry grapes. Wash your grapes (do not dry) we like red/purple for this flavor combo. put in a gallon baggie, sprinkle with cherry jello powder (could use sugar free) & shake to coat. Freeze then enjoy! You WILL be addicted! Try green grapes too & other jell-o flavor combos! That is just freakin’ weird, I have never heard of such a thing!?!?! What a great idea. I had never thought of pureeing frozen bananas. This is even simpler than Hervé This’ chocolate chantilly. Frozen pitted cherries are the bomb!!! They freeze just like grapes. You can but them pitted and frozen at the grocery store.